We turn the best CAKES into SHAKES! We only use the best ingredients for Blu Nektar's signature Cake Shakes. Blu Nektar's Cake Shakes are different from anything you've every tried before. Blu Nektar only uses the finest and more premium ingredients. Each ingredient is individually selected to match the specially crafted Cake Shakes to ensure the highest quality product we can offer. 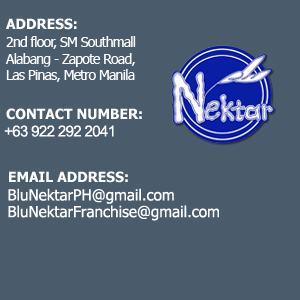 Blu Nektar is also a local Philippine company with roots tied to Laguna. The whole company is the result of good old Pinoy hard work and determination. And finally, Blu Nektar is unique. The concept of our signature Cake Shakes were not made to follow trends, instead they were all designed to be unique than what you have had in the past. Truly, with just one sip, you will know the difference.